Transcending The Drama Triangle | Cleveland Consulting Group, Inc. Occasionally, I come across an executive team that seems to generate drama the second they enter the room. Individually, each seems to be able to separate from the drama enough to be effective when not together. Intuitively, I often referred to them in my mind as the “drama teams” to describe the transformation that seemed to only occur when in each other’s presence. As I observed the team over time, I began to realize that a tense energy seemed to fill the room until each person assumed a specific role. It felt like some form of family dynamic. As I explored these dynamics, I came across Eric Berne’s transactional analysis1 . At first, it seemed like it might have some value. 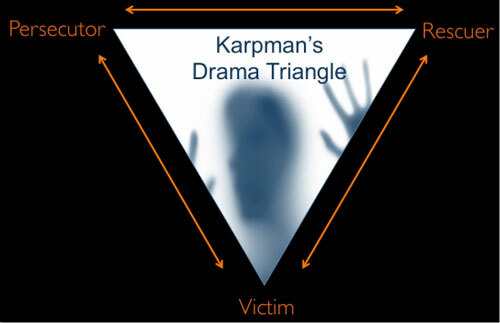 However, when I discovered that Steven Karpman had extended the concept into the Drama Triangle–victim-rescuer-persecutor2, I realized that I had found a tool that could support my team coaching. 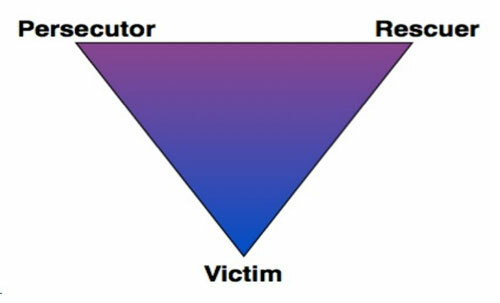 The Victim-Rescuer-Persecutor Triangle is a psychological model for explaining specific co-dependent, destructive inter-action patterns, which negatively impact team dynamics. Each position on this triangle has unique, readily identifiable characteristics. Whenever a person becomes entangled in any one of these positions, they literally keep spinning from one position to another, destroying the opportunity for healthy relationships and productive team dynamics. The good news is that once a team becomes aware of these positions and chooses to break this cycle, they can transcend the V-R-P Triangle. Resolving these dysfunctional behaviors is one of the main keys for eliminating our own dysfunctional tendencies individually and as a team while creating healthy personal and professional relationships. Feels victimized, oppressed, helpless, hopeless, powerless, ashamed. Looks for a Rescuer that will perpetuate their negative feelings. If stays in Victim position, will block self from making decisions, solving problems, pleasure and self-understanding. Watching executives move from a strong, confident presence to one with weak self-efficacy when entering the arena of the executive leadership team is an intriguing process. Suddenly, the person transforms and honestly believes they have no power and that nothing positive will ever happen for them. At the extreme, their focus is on the past and negativity. They can spend endless hours talking about their problems, their bad luck and how they have been hurt. They can be depressed and wallow in self-pity. Their suffering seems to be their identity. Things are never right and there is never enough--time, support, resources. They seem (and often feel) helpless, hopeless, reacting rather than responding in a healthy way to the world. They always need something more before they are willing to take responsibility for their life, to take any action, or to change--more attention, more time or more information. They tend to be confused, living in constant distress and fear of making a mistake or looking foolish. They always have an excuse for inaction as if locked into active inertia. Apathy, depression and anger are typical interwoven symptoms. Even when something good starts to happen, they will tell you "I know it won't last" and, as they predicted, it soon ends in failure3. After spending time with a victim the team can feel worn out, depleted and depressed from the negativity. Team members may feel as if their energy has been drained from each one of them. Regardless of how much time, attention, information, energy or support the team, individually and as a whole, provides the Victim, they seldom change. It is important to remember that people only change when they are ready to take full responsibility for all of their thoughts, words, actions and creations--till then, there is little positive momentum! For example, one executive leadership team was “lost in its own bitching.” The senior executive struggled with attention deficit traits where he would change his mind and instructions with each person he addressed. When the dynamic was revealed and that there were several things that the leader could do to reduce the sense of daily changes and confusion, his response was that he saw no problem with his behavior and explained multiple reasons he could not change. He accepted no responsibility for his behavior or actions, or, more importantly, no responsibility for the unintended consequences that was causing much of the disarray within his team. The team coaching was not impacting the leader even though the team now understood the executive’s implicit victimization process. The team began to workaround the executive; however, the executive’s behavior was highlighted by headquarters which removed him when no behavioral improvements were made. Rescuers believe they have all the answers and know the right solutions for others. Although their own lives are often in shambles, they spend hours, days, weeks or even years attempting to change, control and to get respect from others. Rescuers frequently wear a false cloak of power and superiority, always appearing to be confident and in control. Rescuers tend to thrive on taking care of and attempting to direct the lives of other people. Through controlling and changing others, Rescuers attempt to gain a sense of identity as well as to gain attention and respect from the team members. They pretend to know more than other team members and frequently have an answer for everything, even though they have little, if any, actual knowledge or experience regarding the subject. A Rescuer, on the surface, is often depicted in movies as the "hero" wearing a white hat and riding a white horse. Rescuers are personified and glorified as saviors or white knights saving others from distress and evil, especially in their own minds. Without someone, something or a cause to Rescue, these people are lost and jobless! They don't realize they need to rescue themselves! RESCUER - "Let Me Help You"
Rescues when really doesn't want to. Feels guilty if doesn't rescue. Expects to fail in rescue attempts. An executive took over the talent development function of the organization. He came into the organization with a reputation for “blowing things up” under the auspices of building something better. Organizationally, he was perceived not as a problem solver but as a problem creator. Often, highly successful programs and functions had been dismantled. As the work began to reassemble into the “envisioned” improvement, massive problems often arose. No longer being seen as a rescuer, the individual would transfer to his next savior role, leaving absolute chaos behind him. As often happens with rescuers, they often slide into either being a helpless victim or an enraged persecutor. In this case, most of his key team members were well aware of the dynamics of the executive; quickly, they sought transfers out of the areas. The CEO recognized what was occurring and informed the executive that he would support the individual’s new plan. He added that there would be no transfers for him until he finished the rebuild and if he in fact did not deliver the promised results, he would be terminated. Executive teams are no strangers to raging executives who bully others. Persecutors blame others for their upsets. For example, one CEO professed that he wanted more collaboration within his senior leadership team. Shortly after sitting in the first meeting, the CEO proceeded to talk for nearly an hour while pouncing on anyone who offered alternative thoughts. When this was brought to his attention, he initially discounted it by questioning my observation skills. When I noted the exact minutes that he had spoken versus the combined team, he became enraged with me. When that did not work, he moved into a mix of victim and rescuers. On one hand, it was not his fault that he had a weak team and more importantly, he had to shape them up to be stronger. Interestingly, Victims and Rescuers can become Persecutors, venting their frustration, anger and resentment at others, blaming others for their negative feelings. Rather than taking personal responsibility and walking away from the person who they accuse of irritating them, they stay locked into the destructive patterns, antagonizing and attacking the "source of their frustration." The Victim is angry with the Rescuer, claiming they push too hard, demand too much, bring up pain, pressure them to change, etc. The Rescuer is angry with the Victim for not appreciating, not understanding or not changing fast enough, making comments such as "if only you had taken my advice, if only you would listen, change and do what I say ... etc." Persecutors punish others through destructive actions such as dominating, controlling, nagging, belittling, shaming, blaming and humiliating. A Persecutor needs to disengage, to focus on taking care of themselves and getting their own life in order! One executive leadership team was comprised of the CEO, COO, and CFO. The CEO was relatively new to the position, however he had over 20 years experience in the organization. The COO had 10 years with the organization and a prior history of working with operating authority comparable to CEO/COO. The CFO had over 30 years experience in a variety of organizations and had joined the organization and team three years earlier. During meetings, the COO often took the opposing view to the CEO regardless of the discussion. Frequently, the COO would move into sarcasm and occasionally into outright rage towards the CEO. Later, it was revealed that he was enraged with the CEO getting the promotion to lead the organization. The CEO would stand his ground during most meetings; however, afterwards he would succumb to a weakening sense of self efficacy. During these incidents, the CFO would not challenge the COO and often would seek to support the CEO albeit feint-heartedly. Often, he would try to rescue the CEO and when rebuffed, he would get enraged or move towards being a victim. The process continued for many months because they seemed to unconsciously convolute each incident by each becoming a silent victim. The persecutor COO would realize he had gone overboard and become a victim by stating it was the CEO’s fault. The CEO would blame the COO and CFO for not supporting his direction and leadership and the CFO blamed the CEO for not listening to him. It felt like a soap opera. Simply becoming aware of and understanding these patterns are good first steps for any team or individual. Once the team and members are aware of the drama patterns they can choose to change (break free) and to step off the triangle. However, understanding that most executives really do not want to know about their drama triangle, nor do they want to change, makes it much more difficult to avoid getting caught up in their individual and team dynamics. The unconscious aspect of the drama often results in few executives being willing or committed to making the effort and taking the actions required to actually change their circumstances. Rescuers, people who initially appear to be so caring and self-sacrificing, are often dysfunctional. This is especially true if they are playing the role of Rescuer in an attempt to feel good about themselves, to gain attention, feel more powerful or to control others. Drama Triangles are living proof of Richard Bach’s insight in his book Illusions: “Argue for your limitations and they are yours!" Oddly enough Rescuers are seldom happy in their own personal life and their relationships are usually in chaos. They never seem to be able to use all their "supposed knowledge" to manage their own lives. Initially, I approached the situation by trying to work with each executive. It became clear that the dynamic was more related to the team than to the individuals. Moreover, it was clear that discussing the dynamic as a drama triangle was not going to “fly well” with the executives. Rather, I focused on team dynamics that included highlighting triggers that seemed to ignite the triangle. First, it was noted that whenever the CEO took a strong position, the COO would immediately discredit the position and eventually would discredit the CEO personally if the conversation was not moving his way. At this time, the CFO would often move into to support the CEO whereupon either the CEO deflected the support or the COO attacked the CFO for not supporting him. This was diagramed to indicate the flow of energy and how the process unfolded. After some initial hard swallowing of pride and intense emotions, it was acknowledged that this did in fact occur often. From that point, the team was taught to recognize when the dynamic was beginning to occur. They discussed ways that they could support rather than undermine each other--by focusing on team and organization success. A team “rules of engagement” was instituted that included cues to prevent the formation of a drama triangle. Moreover, the team was taught how to have constructive confrontation. In addition, individual coaching took a turn into how each member unconsciously contributed by assuming their different roles. Understanding how they individually contributed to the drama triangle enabled the team to move out of it and into more emotionally intelligent meetings. What is my motivation for acting the way I do? Am I consciously acting out of choice and giving freely, or are my actions designed to change, control or get something from others? Do I give and do things freely, or do I have expectations? The minute we expect things in return from people, we are being dysfunctional. The key to getting off the triangle is to change from external referencing (the unhealthy and dangerous pattern of looking outside of ourselves for approval, answers, solutions, love, our identity and happiness) and to start internal referencing by developing adequate internal authority and self-efficacy. The person (or team) must stop looking outside and be willing to go deep inside to get in touch with their authentic self. At this junction, it is common for the individual or team to recognize that healthy relationships, whether personal or professional, include some aspect of honor, respect, sharing and communicating. To move toward such healthy relationships, each person must be willing to stay fully engaged and present, to tell the truth as best they can, to be independent, and to take absolute and total responsibility for every aspect of their life, including their time, happiness and success. The Victim must stop looking for someone or something outside them to fix them, to give them the answers or to give them the love and support they need. The Rescuer must stop trying to change, control or get support from others. Both must learn how to love, honor, respect and support themselves. Persecution, blaming others, only creates further negativity and never accomplishes anything positive. Each of these unhealthy and dramatic positions leads to even more serious challenges. To break free, clients must learn to improve their attitude towards change, control, risk and responsibility. They must make peace with and welcome change and begin to reframe their perspective so as to see life as a grand adventure rather than a prison sentence to be endured. Moreover, they must find the courage to permit themselves to be perfectly imperfect. This means appreciating who they are individually and as a team. Unfortunately, most executives have developed much of their self efficacy through external approval and external comparisons. This is like building one’s self-identity without a solid foundation that can be shaken with the presence of any other executive. To overcome or to dissolve the drama triangle for an executive team, at least one person much recognize that the drama triangle is occurring. From this acknowledgment, the individual can begin to witness how the roles develop in meetings and rotate between the members. 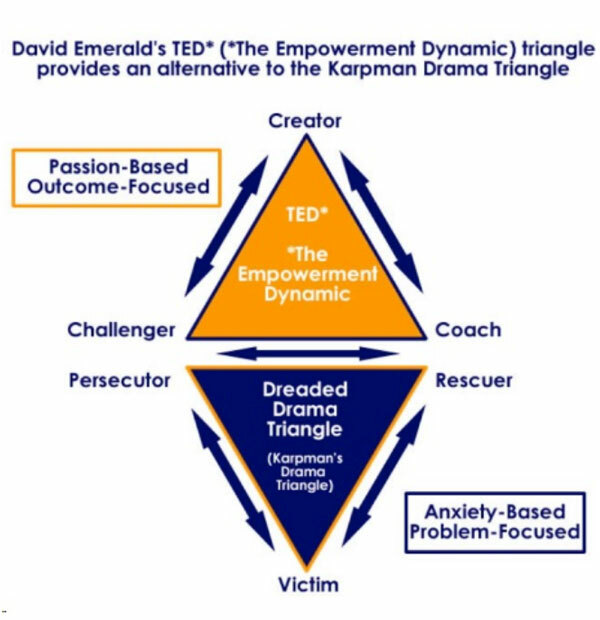 Dave Emerald developed a polarity map of the drama triangle called the Empowerment Dynamic. It suggests moving into the positive pole of the interpersonal dynamic by challenging instead of persecuting, coaching instead of rescuing and creating versus victimizing. Creator— is the central role in TED* (*The Empowerment Dynamic), which taps into an inner state of passion. Directed by intention, a Creator is focused on a desired outcome, propelling the person to take Baby Steps toward what they want to create. A Creator also owns their ability to choose their response to life circumstances. The role of Creator is the alternative to the drama triangle role of Victim. Challenger— is focused on learning and growth, holding a Creator accountable while encouraging learning, action, and next steps. A Challenger consciously builds others up, as a positive alternative to putting someone down by criticizing, blaming, or controlling. The role of Challenger is the alternative to the drama triangle role of Persecutor. Coach— uses compassion and questions to help a Creator develop a vision and action plan. A Coach provides encouragement and support, in place of “rescuing” actions. The role of coach is the alternative to the drama triangle role of Rescuer. Regardless of how you decide to accept full responsibility, individually and as a team, for your actions, if you or the team are willing, honestly ask the following questions, both individually and as a team. The dialogue will move into the drama dynamics which will reveal the unconscious and often unspoken frustrations of the team. What part am I playing in all this? Why am I creating this? In what ways am I still on this triangle? Am I a helpless Victim or am I somehow, consciously or unconsciously, creating this? What can I do to change this? How can I take positive action to create something more harmonious, more positive? What part is the team playing in all this? Why are we creating this? How are we creating this? In what ways are we still on this triangle? Are we a helpless Victim or are we somehow, consciously or unconsciously, creating this? What is it that we really want, need or desire for our self and from others?" How can we take positive action to create something more harmonious, more positive? When the team moves away from feeling powerless and blaming others, to the place of focusing on what it is that it truly wants, it can to take powerful positive steps. Ask yourself, where in my body am I feeling it? Take a moment and really feel all of your feelings without judgement. In this moment, what is the single most important thing I can do to take care of myself? What is it that I truly want, need or desire? What positive changes can I make in my life, right now, that would assist me to accomplish this? What positive actions can I take, right now, that would best support my process - and allow me to take total responsibility for my life? What positive actions can I take to continue to support myself as I risk, learn, change and grow? What can I do, right now, for myself that would be positive kind, loving, gentle, nurturing and supportive? What goals, dreams and objectives would I like to achieve and in what time frame? What are the positive things in my life that I am grateful for? Make a list every day! Ask, decide and choose - What are the most important actions can I take, right now, to start my life moving in a positive direction? Take positive action and start moving right now. Keep your focus on where you would like to go and who you would like to become - not where you have been! 1 Transactional analysis (abbreviated to TA), is a theory in psychology that examines the interactions, or 'transactions’, between a person and other people. The underlying precept is that humans are social creatures and that a person is a multi-faceted being that changes when in contact with another person in their world. Canadian born US psychiatrist Eric Berne developed the concept and paradigm of TA in the late 1950s. 2 The Drama Triangle by Steve Karpman evolved from Berne’s transactional analysis. Karpman was a student of Berne. He believed that a variation of the Parent-Adult-Child was commonly in a drama triangle consisting of the victim-rescuer-persecutor. In class, Karpman noted that brainstorming was the rule in the Berne’s Tuesday night 202 seminar with weekly credit for new theory. Dr. Eric Berne as editor of his T.A.B. said to me “They will quote you for 150 years so get it right.” He suggested alternatives, the name of Aggressor and to put the Victim on top, manipulating the action. To his basic game formula he then later added the switch (S), now it reads C+G=R->S->X->P. The Drama Triangle won the Eric Berne Memorial Scientific Award in 1972. The TAJ January 1973 acceptance speech is posted on my website www.KarpmanDramaTriangle.com. 3 Cliches often surface such as “waiting for the other shoe to drop” indicating that all good deeds are punished or that all good results are short lived. 4 Society has programmed us with the dream of being rescued. Books and movies are filled with Victim-Rescuer stories like Cinderella, The White Knight on the White Horse, Superman and Rambo. Some people spend their entire lives waiting for someone or something external, such as the right relationship, marriage or even having a child, believing this will somehow magically fix everything, saving them and providing the perfect solution to all their problems.